We heard a lot about autonomous transportation and “mobility” as abstract concepts in 2017. But we also drove cars. Good ones. Actually, some blew our freaking minds. Driving’s not dead yet, and we’re happy to share the cars that proved that to us this year. Unlike some publications, we do not trip over ourselves to give awards to our advertisers. We work for you, the readers. So what we do instead is just tell you about all our favorite things we drove in 2017. And of all the amazing supercars, off-roaders, new metal and classics everyone on Jalopnik’s staff drove this year, these were the favorites. I’ll be real and say I thought 2017 was largely a disappointing year for new cars. (I mean, everything else too, but we’ll stick to cars here.) A lot of good stuff got killed off. Everything in the pipeline seems to be an autonomous minivan. The auto industry now cares more about figuring out how it will compete with doomed, profit-averse startups than actually building cars people will want to buy. 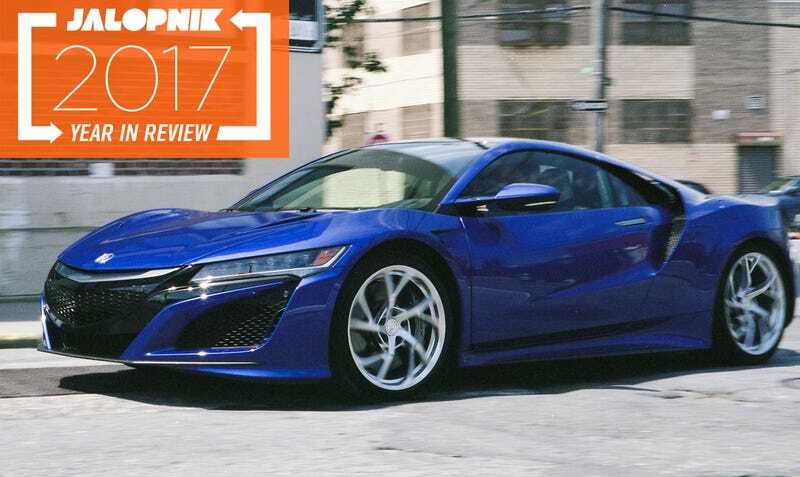 But the Acura NSX makes me optimistic about the future. Finally here after so many delays, it perfectly mixes a racing-grade traditional engine with the limitless torque of our looming electric tomorrow. It also happens to to be, probably, the best handling car I have ever driven. Yes, it’s different than the first NSX, but it accomplishes the same task: it’s a livable, everyday exotic that pushes the boundaries of current technology. Not everyone is going to get it, but the NSX is the real deal. And more than that, it actually makes me hopeful for what’s next. For these lists, I usually like to pick one new car and one old car. I drove fewer old cars in 2017 than I would have liked, so I’ll give my second award to a new car that’s perfectly old-school instead. Listen: the Shelby GT350R is fantastic. I’ve never been a huge Mustang guy, but this is easily in my top-1o-best-ever list. It is a symphony of noise and joy. The 5.2-liter, 529 HP flat plane crank V8 is a love letter to the entire concept of internal combustion. I took this around Detroit while helping with an episode of Car vs. America and drank in that sweet V8 sound with the windows down, The Black Keys on full blast, tire smoke in my rearview mirror and crisp manual gear shifts assuring me I had made excellent decisions in life just to get a little seat time in it. It’s wonderfully balanced and totally overkill at the same time. Most cars can do one, but not both. You may never get to buy a GT350R. That’s fine. But you really ought to try and drive one before you die. Enthusiasts and self-hating mechanics have waited a long time for Alfa Romeo to come back to our shores. And as a driver’s car, the 503 HP twin-turbo Giulia Quadrifoglio is simply outstanding. It looks good, it sounds amazing, it delivers exhilarating power, and it does something that the BMW M3 and a slew of German competitors haven’t done very well in a generation—it manages to be fun. As I said in my review, when this thing is on, it’s on. Okay, so it drives great. But what about the notorious quality issues that have plagued nearly every Giulia tested by journalists, issues that customers have faced too? When I went to Iceland this spring, I was hoping to drive something I couldn’t get in the states. The beaten-to-all-hell, five-year-old bare bones Suzuki Jimny I pulled out of a rental lot certainly fit the bill. I almost put it under the worst cars I drove this year, since it was all rattles and road noise with a suspension that left me sore after an hour of driving. It also rolled backwards while trying to climb what seemed to be a reasonable hill in first gear. This was the entrance to our Airbnb. And that was just one tourist’s four-day jaunt. This Jimny had clearly been through the wars. It was covered in dings, scrapes, cracks and road burn. And yet, it kept on ticking. It carried my boyfriend and I halfway across a rugged and beautiful country with only the slight hiccups mentioned above. Little Jimny, you may not be powerful, comfy or classy, but you are definitely one of my favorites. The Golf R gets called out for being a little bland, but frankly, that’s kind of key to its appeal. As far as sleepers go, it’s probably got one of the strongest style-to-substance ratios on the road. Put another way: it looks as anonymous as your aunt’s commuter car and it’s a fast freaking riot to drive. Let a well-established VW tuner build a crate motor for it, pipe that through an exhaust that hits every shift with a bass drop, you do a little damage to the car’s daily drivability. But you’ve also got yourself one of the most explosively hard-launching cars you could imagine. And unless you cover it in stickers, it still looks like any other modestly priced grocery getter. By the time we finally got to meet the Dodge Demon, we were all so drunk on hype that I’m a little surprised Fiat Chrysler’s PR reps let us behind the wheel. But not only did we get to drive it; we had the chance to unleash its full 840-horsepower fury with high-octane race gas, the TransBrake activated and a wide-open drag strip. I think it’s great, cool and hilarious that a mainstream car company like Dodge went ahead and built a street legal production car that can run nine-second quarter miles. But the amount of thrust this thing blasted through my body in a full-power launch is something I’ll never forget. It literally brought tears to my eyes. This car is known for its noise and instant-classic exterior design, but I’m happy to report that driving the F-Type SVR is even more fun than listening to it or seeing it swoop by. What impressed me most about the meanest version of Jaguar’s prettiest car wasn’t how fast it was (very) or how nicely balanced it seemed (think sword-on-two-fingers). The F-Type SVR had the unique ability to make me feel like a hero, and that the car’s immense supply of power was mine to wield in totality. At the same time, the car commanded respect and always seemed to have just a little more energy than I was willing to tap. This AMG V8-powered seven-passenger SUV on tires as tall as conestoga wagon wheels does not speak to a typical driving enthusiast’s idea of what makes a “good car.” But unlike the high-horsepower version of the G-Class, the GLS does not exist purely to prove Germans have a sense of humor, either. The cockpit of this vehicle was so nicely nestled between aggressive and comfortable, while feeling really futuristic without trying too hard, that I have to call it out as one of the nicest offices I rolled around in this year. The car’s legendary exhaust snorts didn’t hurt in winning me over, either. Of course it’s fast. But even though it looks a little tame now next to its new stablemate the Senna, the 720S blew me away with design details. The see-through roof and Transformer-looking doors! The complex webwork around the headlight! The all-business multi-mode dashboard! And talk about modes... the variable traction control we’ve been colloquially calling “drift mode” is nothing short of extraordinary engineering. I was really impressed with how quick and composed the 720S was on Italian country roads too, but a couple laps around a race track just straight-up knocked the wind out of me. I had to think long and hard about whether I really liked the Chevy Bolt for what it is, or if I just felt obligated to embrace it for its perceived significance in our industry and era. But thinking about its low-key look, complaint ride, and most importantly, how nicely the vehicle’s one-pedal driving made me San Francisco’s heavy traffic seem relaxing, I think, yeah, this really was one of my favorite cars to drive. There were so many ways Jeep could have screwed up the most important vehicle in its lineup. But instead of watering down the Wrangler JL, the brand took the outgoing Wrangler JK’s annoying little issues and fixed pretty much every single one of them. The result is a more refined, less-flawed Jeep. Yes, the ride and wind noise are still very Jeep-esque, but so is the off-road capability. And my god is it a beast. It wasn’t exactly fast, it didn’t handle like a supercar, and its interior wasn’t particularly glamorous, but the all-wheel drive, diesel, manual Mazda6 wagon that I drove through Romania was about as Swiss Army Knife-ish as any vehicle I’ve ever driven. It could slither up windy roads without wallowing like a drunkard, it could cruise on highways and get decent fuel economy, it could go on dirt roads without fear of getting stuck, and it could swallow a crap-ton of junk in the back. With the manual transmission and the torquey diesel engine, it was actually reasonably fun to drive, which isn’t something you can say about many vehicles offering that much room while at the same time yielding that much fuel economy. Driving the Mazda6 reinforced my longing for more diesel manual wagons in America. When I first looked at the Monroney sticker on this car, I freaked out. $175,000 for what!? There was no way it could be $75,000 better than a Jaguar F-Type R Coupe and $25,000 better than a Maserati GranTurismo MC. No way. But, buddy, you better believe it is. This is one of those rare times when I think the price of the machine is totally justified. The AMG GT C sets a new standard in what’s to come in terms of performance luxury. The suspension makes the whole car feel like it was whittled out of a single block of space metal. You always know what’s going on under the wheels. Magic. And it is incoherently fast. The engine is so powerful and shoots the car forward so rapidly that you feel like you’re barely hanging onto a small fighter jet. The dual-clutch transmission shifts are lightning-quick and the steering is sharp, precise and hydraulic. Overwhelmingly capable, I think was my overall impression of the car when I finally had to give the keys back. As you would expect, the interior is finished in quality materials, too. Little rattles and squeaks inside cars bug the hell out of me, but I can imagine the inside of the GT C staying buttoned down and tight for a very, very long time. It was rare, in 2017, for any of us to get our hands on something with a naturally aspirated engine. And a naturally aspirated V8, no less. Thankfully, Lexus is still putting wondrous 5.0-liter V8s in its cars. How much longer this will last is anyone’s guess, so we’d better enjoy it while we can. It’s true that the Lexus gets bogged down by menial things (it has too many gears, it doesn’t have quite enough power), but it is so beautifully machined and comfortable that you hardly notice these factors after a while. I could drive across the country this car. Easily. And what’s more, I’d actually want to. We’ve read the comments on Lexus’ current corporate front, and whether you find it hideous or gorgeous, you also cannot deny that it is striking. And when you’re behind the wheel of a smooth, sleek and striking machine such as this, you do feel special. The uninhibited V8 snaps and growls richly and the leathers inside are appropriately buttery. In short, it’s a lovely place to sit. As someone who has been obsessed with Volkswagen Beetles his entire toilet-trained life (and perhaps a little before; it was a long process) actually getting to drive a real, well-sorted Class 11 car was sort of like meeting a hero. Only this hero didn’t let me down by saying something terrible or groping anyone. It just made me very, very happy. Class 11 Beetles are the purest athletes of the Beetledom. They’re not wildly modified from a stock Beetle, so it’s different than seeing some radically modded VW-based dragster or sandrail—it’s basically that same little car you’ve been puttering around in for decades, just doing extraordinary things. This Class 11, built by the remarkable Project Baja team, is so well-thought out, engineered, and maintained that it might just be one of the best Beetles, mechanically, I’ve ever been in. To say those guys know what they’re doing is like calling The Room “not a great movie”—it’s not nearly enough. This Class 11, which I’ve found is named Tope, just finished the Baja 1000 race about a month ago. That’s amazing, and I’m honored I got a chance to bounce around in this crazy little beast. The body was supposed to be for a rear-engined NSU, but SEAT adapted the design to this front-engine/front drive, Fiat-based drivetrain. Normally, I’d mourn such a conversion, but the resulting car is just so damn appealing and fun to drive I can’t be mad. I only got to drive the Bocanegra a bit around SEAT’s factory grounds in Barcelona, but I loved every minute of it. The car is light and nimble, basic and honest. It has a certain light, crisp feeling that’s largely lost on modern cars. I love the look, I love the way it feels to drive, and I think this is a severely under-appreciated classic. This would make a fantastic daily driver: practical, economical, and fun. Too bad the number of them in America is somewhere in the low zeroes. Still, somebody should import one of these and see that I’m, unusually, right. Oh, come on. You knew this car was going to make it on here in some way or another, because you can’t deny the power of the Mazda Miata. The Miata’s now in its fourth generation, and it sure is lovely. I got a Grand Touring RF version this year, which meant it was the top trim and it had the fancy robo-roof that went down with the push of a buttom. For any other car, I’d get my wrist slapped for simply saying it “handles like [insert car] should handle.” But this Miata handles like a Miata should, and when we’re talking about Miatas, that means something. It’s light. The weight feels so evenly dispersed and the steering is touchy, tight and immediate. It turns just like the happy-looking third-generation Miata before it did, but the new car looks like it wants to bite your arm of instead of giving you a hug. But never mind my words. This car was so great that my Miata-obsessed mom is now looking for one, even though she’s only had her third-gen for a few years. And she helped pay for two daughters’ weddings this year. Unfortunately, that wedding help means I’m having a rough time convincing her to give me a discount to buy hers. Few cars I’ve driven have left me giggling as much as the Formula E car, which I got to test out after the Mexico City ePrix. It simply has the most essential elements of fun right there: low weight, lots of torque. It’s not overly reliant on sticky tires or aerodynamics to pad its stats page with outright speed—it’s just fun. It’s an incredibly well-balanced and surprisingly user-friendly car, with centrally located batteries that can pump out anywhere from 110 kW (147 HP) to 200 kW (228 HP) depending on how it’s set up. This is adequate for the 1,940-pound vehicle. Put your foot down and I’m pretty sure the torque will pull your face-muscles back into a big, dumb involuntary grin. I don’t know if Formula E knows make electric racing cool yet. It’s hilariously close racing with a deeply talented set of drivers. And the less-grippy, road-car-like tires allow the cars to dance and drift under a driver who’s really pushing it. Yet the series can be hard to follow in person unless some kind person up-track is yelling “CARS!” as the front-runners approach your seats. But man, the car itself that Formula E uses is pure joy. When these show up used—which should be soon as the series moves to a new car next year—this would be my idea of the ultimate track toy. When I went to check out the “Microcar Mania” collection at the Lane Motor Museum, there was a delightful smorgasbord of weird front-door cars to try. It was heaven. There was the BMW Isetta, which I was particularly interested in since my Mom used to have one. The Heinkel Kabine was a slightly nicer-optioned version of the front-door microcar. There was also the Teilhol Citadine—an early electric car whose front door opened straight up! But none of these were as fun as the front-door car with two doors: the Zündapp Janus 250. The Janus is a simple but brilliant little person-mover. There’s a door in the front and a door in the back, in case you haven’t worked out the origin of its name yet. Both seats have ample leg room thanks to the car’s ingenious, slightly pyramid-like shape. It’s small but it felt far roomier than it had any right to be thanks to a bright, open greenhouse. The front and rear bench seats also folded flat, in case you wanted to camp out in the little car. The engine sits in the very center of the Janus, just like many race cars! While the tapered front-door cars like the Isetta and Kabine were surprisingly more stable than I expected, the Janus’ more conventional square wheel layout made it handle really well. Light weight and a peppy engine made it a genuinely enjoyable driving experience. I’m slightly saddened that the Janus’ odd seating layout hasn’t made a comeback now that everyone’s “rethinking the car” thanks to all the autonomous and electric ideas floating around. Bring back front doors! It feels like I’m cheating if I pick a Porsche 944, or even Blake Z. Rong’s 1987 Porsche 924S that I drove around for a couple weeks. Those would be no-brainer best picks for any round-up of “bests,” but I own a 944. Of course I like that car. So, let me pick the modern-day 944 that I hadn’t driven until this year: the Toyota 86. The new 86 has a deeply irritating infotainment system, as too many good cars seem to be saddled with now. Yet one important feature offered on the 86 could help you overlook that: three pedals. A manual 86 is beautifully balanced and fun to chuck around. Unlike a vintage 944, it’s built with modern safety features that will protect you a bit better if Austin drivers do what Austin drivers love to do and wreck your car. Power was surprisingly adequate despite the Internet’s protests otherwise—at least to a naturally aspirated 944 fan. It also rips donuts like a champ, and is shockingly practical for the daily driving needs of one person. Please give me the 86 back. Please? I hate air-cooled 911s. Well, let me re-phrase that. I love air-cooled 911s. I hate the Air-Cooled 911 People, and am a firm believer that they should be banished from this Earth. But after driving Jason Lichtner’s off-road Porsche on the Los Angeles episode of Car vs. America, I get it. Hooo boy, do I get it. Lichtner’s Porsche started life off as a bone-standard 1976 Porsche 912. Then he threw out the engine for a custom-built, twin-plug flat-six with electronic fuel injection. And while that sounds impressive, it only makes 204 HP. That’s not a lot, but the car weighs nothing. The only other modifications are the big tires and a stripped-out interior. That’s it. And despite that, the thing loves bashing through the desert, scampering up mountains, and generally making a throaty big noise. It’s wonderful. A joy. A delight. And it’s got rally lights. It’s hard to overstate how much I enjoyed driving this thing around Michigan. It’s fast, the interior’s sleek, the build quality (on this particular loaner from Tesla) was superb. Putting aside the qualms against Tesla, the Model S—especially the fully-modded PLOOD—is just a beast of a vehicle. Not to come off too much like a fanboy, but spending a week in the Model S, you start to realize why Tesla has such an allure. Whether it’s relaxing while Autopilot takes over for highway drives or letting the car jam to 60 mph in under 3 seconds, everything about it is fun. How could you not enjoy this Abarth? The whirr of the engine alone is enough to rouse you out of piss-poor mood. I spent a day with one this summer in Long Island, and sitting in the driver’s seat, I felt like I was in a Wes Anderson movie or something. I hadn’t driven one before, but everyone around the office said they’re basic but a blast to drive. And that was how it felt immediately: There’s nothing complicated about it; it’s just a super enjoyable vehicle to tool around in. I had two goes with the CT6 this year—a new plug-in hybrid and the 2018 model that comes equipped with GM’s new semiautonomous Super Cruise feature. For a luxury car, it was easy to see how something like this could edge into Tesla’s market with the Model S—even if it’s not electric. It looks superb, it sounds wonderful, and it can compete with anything in its class. I know the advanced driving aid systems can be annoying, but the CT6 is such a well-rounded product that it’s easy to get over the annoying chirps and chimes. And if you want, Super Cruise can handle driving on the highway. It sounds like hell, but at least the interior’s top-notch and extremely comfortable to relax in. What Singer does when they reimagine a Porsche 911 is something unreal. Thousands of labor hours go into each one. Owners can spec them out in any way they want. A fully rebuilt carbon fiber body adds better curves and angles. Fit an finish that Lexus could envy. On paper you’ll see that the car dropped several hundred pounds, bumped up to nearly 400 HP, and cost you over half a million dollars to complete the restoration. This isn’t about the numbers. Other engines envy the crackles and notes this flat six creates. The driving experience was life changing. I’ve driven damn near every Porsche road car, and have owned a couple too. The way Singer crafts this package together, while dropping several hundred pounds, delivers a driving experience like no other. It’s so crisp, communicative, and intuitive to drive. Not to mention as fast around the track as the 991 GT3. To hell with just making the list for 2017. The 911 reimagined by Singer is the best car I’ve ever driven. Despite claims that “car culture is dying” and fun being sucked out of driving, there are still plenty of amazing vehicles loose on the road. It was true in 2017, and we sure hope to be saying the same thing a year from now.